How do you do it? 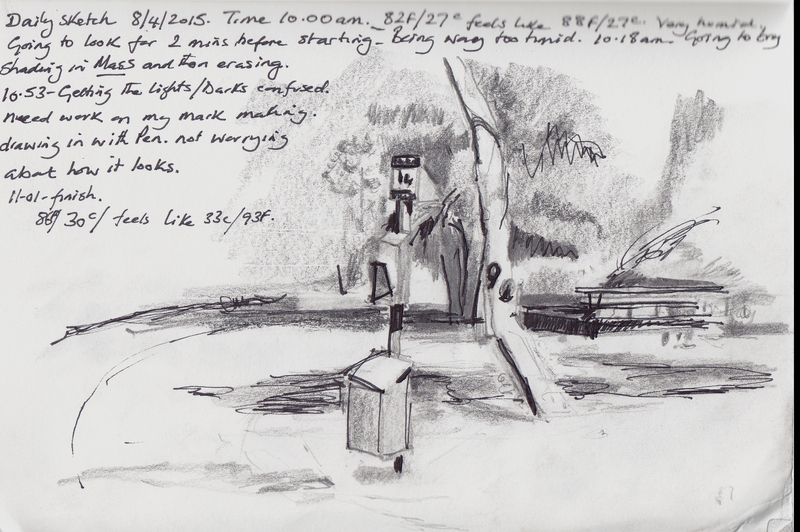 Today was my 4 day of drawing in the park and I will be honest I am struggling. This was my 2nd drawing. At the moment I do not have a chair to sit on and I don’t fancy sitting on the ground. Couple of things, I am too old and fat to sit comfortably on the ground. There are too many ants in the Park, biting ones. So I am relying on Park benches as most are in the shade, much needed in this heat. Unfortunately, most of the them do not have a great view. This particular bench view was situated so you can see across the creek bank. It is basically a view of tangled undergrowth and and spindly trees. You will see I have put notes (a habit I will continue) as I draw. 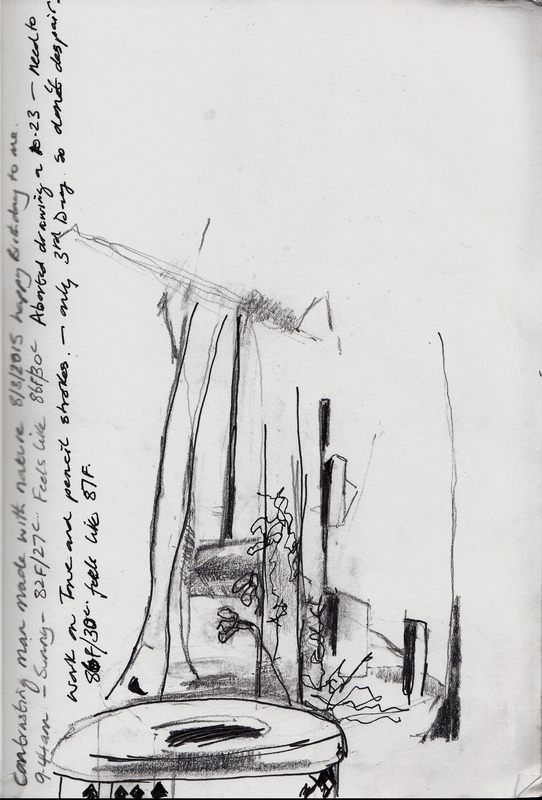 notes for this drawing ‘ contrasting man made with nature. 8/3/2015 Happy birthday to me. 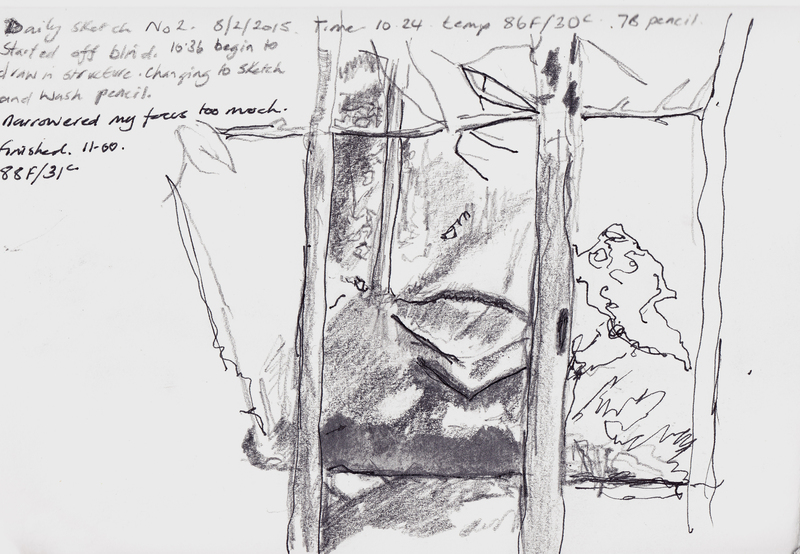 9.44 Sunny 82f/27c feels like 86f/30c aborted drawing at 10.23 need to work on tone and pencil strokes. Only 3rd day so don’t despair . 86f/30c feels like 87f. I must admit to some reluctance today as I know my drawing skills are not up to the challenge of depicting nature. At lot of the park is wide open but it seems the planners have decided to place the benches at the most uninspiring parts of the park, so I will need to invest in a seat or use one of the folding chairs we already have. They are quite heavy, so not an appealing prospect and I have not drawn while sat in them, so not sure I would be that comfortable. With the heat, I need to be comfortable at least. I am sticking to mainly pencil although I have used a fine tipped pen in all of them so far, as I feel I will gain more from seeing the tones rather than working in colour at the moment. I kept getting lost with this drawing. My eyes were wandering all over the place. It wasn’t until the last minute that I realised I had placed the bench on the right in completely wrong place and that was too small! I manage to correct it to a degree but it was important scale mistake. The mass of trees and bushes are proving to to be quite a challenge. I have a lazy right eye so if I closed my right eye, all I see is a blur which is great as it helps to see the real darks and lights but obviously it loses the detail. As far as I can make this park on the whole has not be ‘planned out’ but craved out of what was originally there so lots of different variety of bushes and trees are intertwined leaving a huge mash of textures. Still not sure where this project will lead but ultimately I am determined to combine painting and beading together without it being considered crafty (such a dirty word in the art world) I have thought about doing it in the past but never really got that far with the idea. I must admit I am really inspired by the work of Grayson Perry. While I was in France I saw a channel 4 program on the house he created, it looked amazing and it brought to mind a comment Eileen Cooper made to me when I saw her in 2011 and show her my bead work. She wonder why I was not trying to get it shown in an art gallery and at the time, I was truthful, I didn’t think people would consider it art. This is one of the pieces I created in 2007. 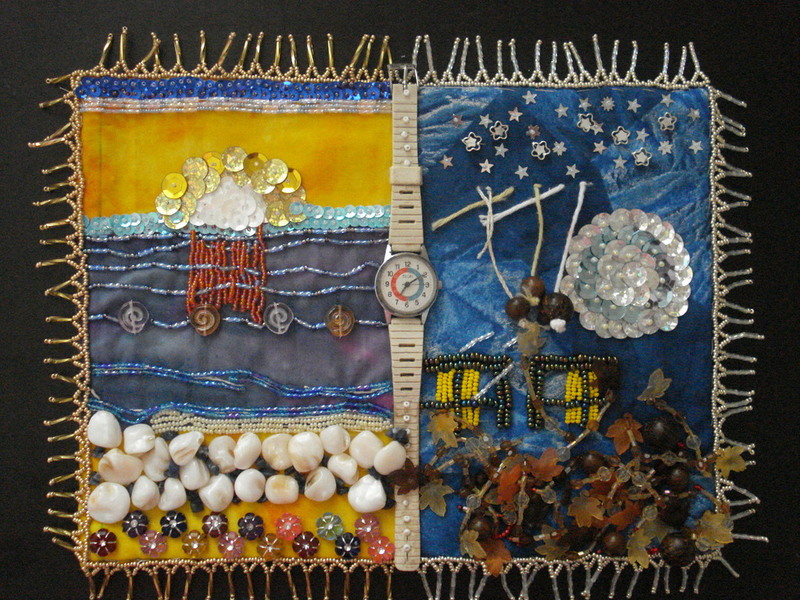 I did a full twelve months, one for each month and it was part of a world wide project. At the time, it was best way to express myself in an abstract form. I still love beads. The third sketch reminds me of one i am working on called “Triangles”. a totally different subject but layout is very similar. I forgot to say that i really like that one very much. I’ve got a small three legged sketching stool which is lightweight and easy to cart around. Graham bought it for me from Tesco. I’m loving the sketches you are posting and hope you keep going.